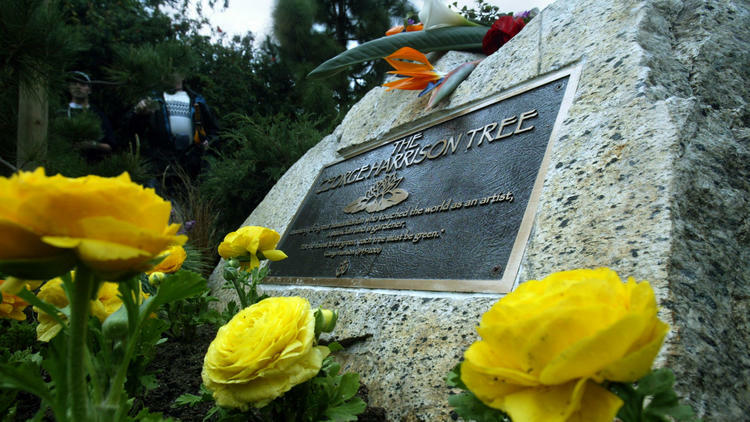 The sapling went in, unobtrusively, near the observatory with a small plaque at the base to commemorate the former Beatle, who died in 2001, because he spent his final days in Los Angeles and because he was an avid gardener for much of his adult life. He famously bought a rundown mansion in England that once belonged to a British lord named Sir Frankie Crisp –the name showed up in the title of Harrison’s song “Ballad of Sir Frankie Crisp (Let It Roll)” from his 1970 solo album “All Things Must Pass” — and over the course of many years transformed the overgrown gardens into lush, beautiful grounds surrounding his home. The memorial tree in Griffith Park had grown to more than 10 feet tall as of 2013, but LaBonge said the tree beetle onslaught was too much for the tree. Trees in Griffith Park have occasionally been the victims of bark beetles and ladybug beetles, among other tree-unfriendly creatures. LaBonge was on hand Saturday night at the Greek Theatre for the final stop on Ringo Starr’s All-Star Band 2014 U.S. tour. A date hasn’t been set for the replanting.